Background: Myocardial ischemia and reperfusion injury mediated by reactive oxygen species (ROS) related to cardiopulmonary bypass has been linked to adverse clinical outcomes following cardiac surgery. The generation of ROS and its clinical impact in patients undergoing transcatheter aortic valve replacement (TAVR) have not been studied. Methods/Design: This is a prospective observational study that will compare the generation of ROS between 12 consecutive patients undergoing TAVR and 12 patients undergoing isolated surgical aortic valve replacement (SAVR) and will determine whether any potential differences are related to the 3-month composite endpoints of cardiovascular mortality, myocardial infarction, stroke, major bleeding or life threatening bleeding. Peripheral blood will be taken immediately before aortic intervention, at the completion of the procedure, 6-8 hours after the procedure, and 24 hours after the procedure for measurements of ROS. Clinical follow-up at 3 months post discharge will be undertaken either in the outpatient clinic or by telephone. Discussion: This study will determine changes in the levels of ROS in patients undergoing TAVR and identify whether any potential changes are correlated with clinical outcomes. Trial registration: ClinicalTrials.gov identifier: NCT02841917; registered on December 29, 2015. Ethics: The study protocol has been approved by the RES Committee North West Liverpool East (IRAS Project ID: 206946). Informed consent: Signed informed consent will be obtained from each patient who wishes to participate in this study. Myocardial ischemia and reperfusion injury (MRI) related to cardio-pulmonary bypass has been linked to adverse clinical outcomes following cardiac surgery (Hausenloy and Yellon, 2007; Scolletta et al., 2007; Cavalca et al., 2013; Rodrigo et al., 2013). Changes in reactive oxygen species (ROS) following surgical aortic valve replacement (SAVR) have been well studied (Cavalca et al., 2013). Transcatheter aortic valve replacement (TAVR) has emerged as a novel therapy for patients with symptomatic severe aortic stenosis (AS) who are considered at high risk of SAVR ( Leon et al., 2010; Smith et al., 2011; Adams et al., 2014; Popma et al., 2014). Increasing operator experience and enhanced transcatheter valve systems have led to a worldwide adoption of TAVR not only in "high-risk" patients but also patients who are at low or intermediate risk (Hamm et al., 2014; Tamburino et al., 2015; Thyregod et al., 2015; Leon et al., 2016). The clinical benefits associated with TAVR at the cellular level may, at least partially, be explained by a reduction in MRI related to the lack of cardio-pulmonary bypass and the relatively short duration of myocardial ischemia. Although TAVR may not expose the myocardium to the same level of MRI than SAVR, patients undergoing TAVR have a greater number of comorbidities and may thus have a greater baseline ROS burden than those undergoing SAVR. The generation of ROS in patients undergoing TAVR and whether any differences in ROS levels in such patients correlate with clinical outcomes have not been described. Our prospective study will attempt to address both of these questions. The proposed study is a prospective, observational, exploratory study ([Figure 1]). Figure 1: Summary of the study protocol. Note: *Blood samples are obtained immediately prior to SAVR or TAVR, 5-10 minutes after reperfusion in patients undergoing SAVR and 5-10 minutes after successful TAVR, 6-8 hours post SAVR/TAVR and 24 hours post SAVR/TAVR. SAVR: Surgical aortic valve replacement; TAVR: transcatheter aortic valve replacement. The study will be performed at the University Hospital Southampton NHS Foundation Trust, UK. Severe AS will be defined by transthoracic echocardiogram as aortic valve area < 1 cm 2 , or index valve area < 0.8 cm 2 /m 2 in the presence of mean aortic gradient > 40 mmHg or peak velocity > 4 m/s. Patients with mean aortic gradient < 40 mmHg and peak velocity < 4 m/s with impaired left ventricular systolic function (ejection fraction < 50%) will undergo dobutamine stress echocardiogram to define inclusion. Patients will be considered symptomatic if New York Heart Association (NYHA) class ≥ 2, exertional angina and/or syncope are present. Inoperability will be determined by the 'Heart Team' due to severe comorbidities, advance age, frailty or thoracic anatomy unfavorable for SAVR. An STS (Society of Thoracic Surgery) score > 8% for mortality will define patients at high-risk for SVAR. A cardiothoracic surgeon, an interventional cardiologist, a clinical cardiologist and a cardiac radiologist will compose the "Heart Team". There are no age restrictions for TAVR. 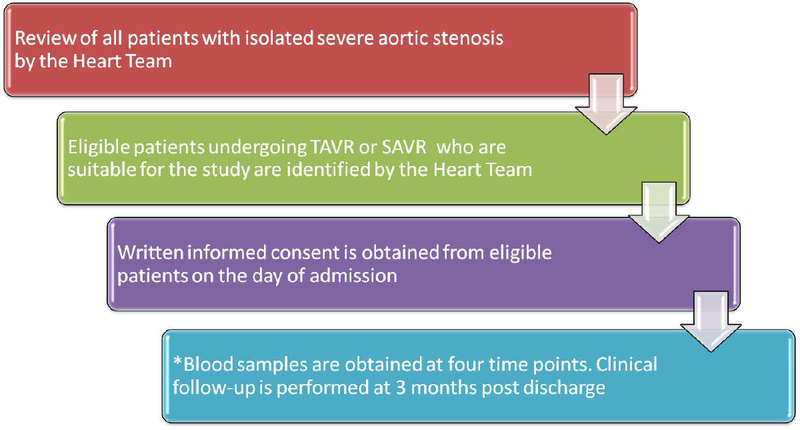 Patients referred to the aortic valve program with severe symptomatic AS fitting the same echocardiographic criteria as patients undergoing TAVR, but at lower surgical risk who are able to undergo SVAR as decided by the 'Heart Team' will serve as the control group. As a guide, an STS score between 4 - 8% for mortality will be used to define this intermediate risk population. There are no age restrictions for SAVR. Angiographic assessment of the ascending aorta and aorto-ilio-femoral tree. Patients will be approached by the clinical team and asked if they would wish to participate in the study. If patients express a desire to participate, they will be given the patient information sheet to read and then approached by a member of the research team who will explain the principles of the project and what participation would entail. In patients who wish to participate, written informed consent is then obtained. Sulfide, thiosulfate, and low molecular weight thiols. A. Cardiovascular mortality: any death due to proximate cardiac cause (e.g., myocardial infarction, cardiac tamponade, worsening heart failure), un-witnessed death and death of unknown cause, all procedure-related deaths, including those related to a complication of the procedure or treatment for a complication of the procedure, death caused by non-coronary vascular conditions such as cerebrovascular disease, pulmonary embolism, ruptured aortic aneurysm, dissecting aneurysm, or other vascular disease. I. Peri-procedural MI (≤ 72 hours after the index procedure). New ischemic symptoms (e.g., chest pain or shortness of breath), or new ischemic signs (e.g., ventricular arrhythmias, new or worsening heart failure, new ST-segment changes, hemodynamic instability, or imaging evidence of new loss of viable myocardium or new wall motion abnormality), AND elevated cardiac biomarkers within 72 hours after the index procedure, consisting of two or more post-procedure samples that are 6-8 hours apart with a 20% increase in the second sample and a peak value exceeding 10Χ the 99 th percentile upper reference limit (URL), or a peak value exceeding 5Χ the 99 th percentile URL with new pathological Q-waves in at least two contiguous leads. II.I. Electrocardiographic changes indicative of new ischemia, new pathological Q waves in at least two contiguous leads, imaging evidence of new loss of viable myocardium or new wall motion abnormality. II.II. Sudden, unexpected cardiac death, involving cardiac arrest, often with symptoms suggestive of myocardial ischemia, and accompanied by presumably new ST elevation, or new left bundle branch block, and/or evidence of fresh thrombus by coronary angiography and/or at autopsy, but death occurring before blood samples could be obtained, or at a time before the appearance of cardiac biomarkers in the blood. II.III. Pathological findings of an acute MI. I. Rapid onset of a focal or global neurological deficit with at least one of the following: change in level of consciousness, hemiplegia, hemiparesis, numbness or sensory loss affecting one side of the body, dysphasia or aphasia, hemianopia, amaurosisfugax, or other neurological signs or symptoms consistent with stroke duration of a focal or global neurological deficit ≥ 24 hours; OR, < 24 hours, if therapeutic intervention(s) were performed (e.g., thrombolytic therapy or intracranial angioplasty); OR available neuroimaging documents a new hemorrhage or infarct; OR the neurological deficit results in death. II. No other readily identifiable non-stroke cause for the clinical presentation (e.g., brain tumor, trauma, infection, hypoglycemia, peripheral lesion, pharmacological influences. III. Confirmation of the diagnosis by at least one of the following: neurology or neurosurgical specialist, neuroimaging procedure (magnetic resonance imaging or computed tomography scan or cerebral angiography), or lumbar puncture (i.e., spinal fluid analysis diagnostic of intracranial hemorrhage). I. Life-threatening or disabling bleeding: fatal bleeding OR bleeding in a critical area or organ, such as intracranial, intraspinal, intraocular, or pericardial necessitating pericardiocentesis, OR bleeding causing hypovolemic shock or severe hypotension requiring vasopressors or surgery, OR overt source of bleeding with drop in hemoglobin of ≥ 5 g/dL or whole blood or packed red blood cells transfusion ≥ 4 units. II. Major bleeding: overt bleeding either associated with a drop in the hemoglobin level of at least 3.0 g/dL or requiring transfusion of two or three units of whole blood/red blood cells OR does not meet criteria of lifethreateningor disabling bleeding. III. Minor bleeding: any bleeding worthy of clinical mention (e.g., access site hematoma), which does not qualify as life threatening, disabling or major. We will compare the generation of ROS in patients undergoing TAVR and SAVR and will determine whether any potential differences are related to the 3-month composite endpoints of cardiovascular mortality, myocardial infarction, stroke, major bleeding or life threatening bleeding. As a "proof of concept study", this study will include 24 patients (12 undergoing SAVR and 12 undergoing TAVR) to generate pilot data to enable us to undertake a more comprehensive, adequately powered study. Continuous variables will be expressed as the mean ± SD. Categorical variables will be expressed as absolute number and percentages. Baseline characteristics and post-procedural differences in markers of oxidative stress will be compared using the chi-square test for categorical variables and one-way analysis of variance (ANOVA) for continuous variables. Logistic or lineal regression analysis will be used to explore the correlation between ROS and composite clinical endpoints in the two groups of patients. Statistical analysis will be performed using SPSS version 16.0® (SPSS, Chicago, IL, USA). Statistical significance is assumed at P < 0.05. Cellular respiration leads to the generation of partially reduced oxygen derivatives called ROS. Under normal physiological conditions, ROS serve as integral components of cellular signaling pathways. A balanced redox state is established between the major ROS producing systems (nicotinamide adenine dinucleotide phosphate (NADPH) oxidase, xanthine oxidase, nitric oxide synthase, myeloperoxidase and lipoxygenases) and the major antioxidant systems (catalase, α-tocopherol, ascorbic acid, superoxide dismutase, glutathione peroxidase and glutathione S transferases that conjugate reduced glutathione to hydrophobic organic compounds and glutathione). Excess production or reduced degradation of ROS by the antioxidant defense systems imposes an oxidative burden upon the cellular environment leading to modification of numerous biomolecules and functional defects. In MRI, the enzyme xanthine oxidase catalyzes the formation of uric acid with the coproduction of superoxide. Superoxide release results in the recruitment and activation of neutrophils and their adherence to endothelial cells, which stimulates the formation of xanthine oxidase in the endothelium, with further superoxide production (Granger, 1988). Oxidation of DNA and proteins may then lead to membrane damage because of lipid peroxidation leading to alterations in membrane permeability, modification of protein structure and functional changes (Zimmerman, 1995). Oxidative damage to the mitochondrial membrane can also result in membrane depolarization and the uncoupling of oxidative phosphorylation with altered cellular respiration. This can ultimately lead to mitochondrial damage, release of cytochrome c, activation of caspases and apoptosis (Nathan and Singer, 1999; Macdonald et al., 2003). One of the advantages of TAVR as compared to SVAR is the lack of the relatively long ischemic period that predisposes to MRI. However, different animal models have consistently shown that rapid ventricular pacing, a required step during TAVR, can also generate measurable levels of oxidative stress (Gare et al., 2002; Díez et al., 2013). Although TAVR represent a much less invasive procedure than SAVR, patients undergoing TAVR have greater morbidities and a higher risk profile than those undergoing SAVR, it is reasonable to expect lower post-procedure oxidative stress marker levels in patients undergoing TAVR compared with SAVR. This in turn may lead to a reduction in the extent of MRI. The aim of this "proof of concept study" is to test such hypothesis. Patient recruitment commenced on November 29, 2016 and the study is scheduled for completion in March 2017. Adams DH, Popma JJ, Reardon MJ, Yakubov SJ, Coselli J, Deeb GM, Gleason TG, Buchbinder M, Hermiller J, Kleiman NS, Chetcuti S, Heiser J, Merhi W, Zorn G, Tadros P, Robinson N, Petrossian G, Hughes GC, Harrison JK, Conte J, et al. (2014) Transcatheter aortic-valve replacement with a self-expanding prosthesis. N Engl J Med 370:1790-1798. Cavalca V, Tremoli E, Porro B,Vegali F, Myasoedova V, Squellerio I, Manzone D, Zanibini M, Trezzi M, Di Minno MN, Werba JP, Tedesco C, Alamanni F, Parolari A (2013) Oxidative stress and nitric oxide pathway in adult patients who arecandidates for cardiac surgery: patterns and differences. Interact Cardiovasc Thorac Surg 17:923-930. Díez JL, Hernandiz A, Cosín-Aguilar J, Aguilar A, Portolés M (2013) Sum of effects of myocardial ischemia followed by electrically induced tachycardia on myocardial function. Med Sci Monit Basic Res 19:153-162. Gare M, Mraovic B, Kehl F, Kersten JR, Warltier DC, Pagel PS (2002) Reactive oxygen species contribute to contractile dysfunction followingrapid ventricular pacing in dogs. Int J Cardiol 83:125-131. Granger DN (1988) Role of xanthine oxidase and granulocytes in ischemia-reperfusion injury. Am J Physiol 255:1269-1275. Hamm CW, Möllmann H, Holzhey D, Beckmann A, Veit C, Figulla HR, Cremer J, Kuck KH, Lange R, Zahn R, Sack S, Schuler G, Walther T, Beyersdorf F, Böhm M, Heusch G, Funkat AK, Meinertz T, Neumann T, Papoutsis K, et al. (2014) The German Aortic Valve Registry (GARY): in-hospital outcome. Eur Heart J 35:1588-1598. Hausenloy DJ, Yellon DM (2007) The evolving story of "conditioning" to protect against acute myocardialischemia-reperfusion injury. Heart 93:649-651. Leon MB, Smith CR, Mack M, Miller DC, Moses JW, Svensson LG, Tuzcu EM, Webb JG, Fontana GP, Makkar RR, Brown DL, Block PC, Guyton RA, Pichard AD, Bavaria JE, Herrmann HC, Douglas PS, Petersen JL, Akin JJ, Anderson WN, et al. (2010) Transcatheter aortic-valve implantation for aortic stenosis in patients who cannot undergo surgery. N Engl J Med 363:1597-1607. Leon MB, Smith CR, Mack M, Makkar RR, Svensson LG, Kodali SK, Thourani VH, Tuzcu M, Miller DC, Hermann HC, Doshi D, Cohen DJ, Pichard SD, Kapadia S, Dewey T, Babaliaros V, Szeto WY, Williams MR, Kereiakes D, Zajarias A, et al. (2016) Transcatheteror surgical aortic-valve replacement in intermediate-risk patients. N Engl J Med 374:1609-1620. Macdonald J, Galley HF, Webster NR (2003) Oxidative stress and gene expression in sepsis. Br J Anaesth 90:221-232. Nathan AT, Singer M (1999) The oxygen trail: tissue oxygenation. Br Med Bull 55:96-108. Popma JJ, Adams DH, Reardon MJ, Yakubov SJ, Kleiman NS, Heimansohn D, Hermiller J, Hughes GC, Harrison JK, Coselli J, Diez J, Kafi A, Schreiber T, Gleason TG, Conte J, Buchbinder M, Deeb GM, Carabello B, Serruys PW, Chenoweth S, et al. (2014) Transcatheter aortic valve replacement using a self-expanding bioprosthesis in patients with severe aortic stenosis at extreme risk for surgery. J Am Coll Cardiol 63:1972-1981. Rodrigo R, Korantzopoulos P, Cereceda M, Asenjo R, Zamorano J, Villalabeitia E, Baeza C, Aguayo R, Castillo R, Carrasco R, Gormaz JG (2013) A randomized controlled trial to prevent post-operative atrial fibrillation by antioxidant reinforcement. J Am Coll Cardiol 62:1457-1465. Scolletta S, Carlucci F, Biagioli B, Marchetti L, Maccherini M, Carlucci G, Rosi F, Salvi M, Tabucchi A (2007) NT-proBNP changes, oxidative stress, and energy status ofhypertrophic myocardium following ischemia/reperfusion injury. Biomed Pharmacother 61:160-166. Smith CR, Leon MB, Mack MJ, Miller C, Moses JW, Svensson LG, Tuzcu M, Webb JG, Fontana GP, Makkar RR, Williams M, Dewey T, Kapadia S, Babaliaros V, Thourani VH, Corso P, Pichard AD, Bavaria J, Herman HC, Akin JJ, Anderson WN, Wang D, Pocock SJ (2011) Transcatheter versus surgical aortic-valve replacement in high-risk patients. N Engl J Med 364:2187-2198. Tamburino C, Barbanti M, D′Errigo P, Ranucci M, Onorati F, Covello RD, Santini F, Rosato S, Santoro G, Fusco D, Grossi C, Seccareccia F (2015) 1-Year outcomes after transfemoraltranscatheter or surgical aortic valve replacement: results from the Italian OBSERVANT Study. J Am Coll Cardiol 66:804-812. Thyregod HG, Steinbrüchel DA, Ihlemann N, Nissen H, Kjeldsen BJ, Petursson P, Chang Y, Franzen OW, Engstrøm T, Clemmensen P, Hansen PB, Andersen LW, Olsen PS, Søndergaard L (2015) Transcatheter versus surgical aortic valve replacement in patients with severe aortic valve stenosis: 1-year results from the all-comers NOTION randomized clinical trial. J Am Coll Cardiol 65:2184-2194. Zimmerman JJ (1995) Defining the role of oxyradicals in the pathogenesis of sepsis. Crit Care Med 23:616-617. GM designed the study. GM, NC, and MM all contributed to writing the manuscript. All authors read and approved the final manuscript for publication.